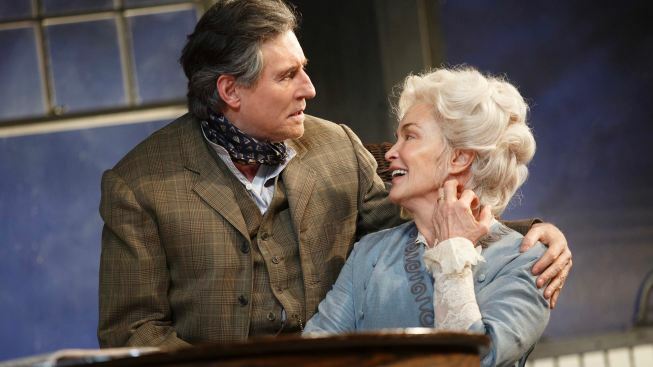 Gabriel Byrne and Jessica Lange in Roundabout's "Long Day's Journey Into Night." Below, Michael Shannon (foreground) and John Gallagher Jr. are sons "Jamie" and Edmund. All four Tyrone family members end up splayed on the floor—at different times, for terribly different reasons—in Roundabout’s first-rate take on Eugene O’Neill’s “Long Day’s Journey Into Night,” now at the American Airlines Theatre. Jessica Lange and Gabriel Byrne lead the cast as Mary and James Tyrone, a drug-addicted wife and her miserly husband, with Michael Shannon and John Gallagher Jr. as sons James Jr. and Edmund, one a barely employable drunk, the other a young man who might have a promising future, if tuberculosis doesn’t kill him first. Lange was Olivier Award-nominated for this role 16 years ago on the West End. Byrne was Tony Award-nominated as Jamie Tyrone in 2000’s Broadway “Moon for the Misbegotten.” They know their O’Neill, and are suited to take us on the roller-coaster ride, set across one day that will prove a turning point in the lives of a troubled family. English theater director Jonathan Kent guides the simple and elegant, nearly 4-hour-long production, split between its four acts with one intermission. Leads Lange and Byrne share an effortless chemistry in which they are alternately tolerant of, and vile toward, one another—but always easily relatable. That’s quite an accomplishment when dealing with a piece of literature that drifts further away from naturalism as the the night wears on. Frail mother Mary, hooked on morphine since a difficult pregnancy, is one-half the emotional linchpin of the drama. The other is Edmund, the baby of the family everyone wants to protect, albeit in ways truly warped … Pop is bargain-hunting for the poor kid’s future sanitarium, for goodness’ sake. Lange is magnetic as the family matriarch with no feeling of rootedness or sense of belonging, certainly not in the waterfront New England summer home the family complains is shoddily maintained. At the heart of her loss is the death of a child, Eugene, infected with measles when Jamie, as a young, sick boy, wandered into his room. Mary blames everyone for Eugene’s death, including herself. In Lange’s hands, the emotions seem sometimes spontaneous, and at others calculated to be wounding: “I blame only myself … I’ve always believed Jamie did it on purpose.” She makes sharp turns with the precision of a race-car driver. Lange still has the planes and proportions of her youthful beauty, but convinces us that she's a woman whose hands are gnarled, and whose grace and bloom have deserted her. In a different lifetime, Mary might have been a classical pianist, but she took up with James and his journeyman actor’s lifestyle, setting a singular path in motion. Byrne, as a semi-successful actor taxed by memories of an impoverished childhood, has to come off as a horrible person, willing to sacrifice his family’s health and happiness to save a buck, but also as a man aware that’s his failing. He succeeds, marvelously. Gallagher, the brilliant musician and actor who originated roles in “Spring Awakening” and “American Idiot,” has the added burden of serving as stand-in for the playwright. Pale, and seemingly indifferent to his own crisis, his Edmund prepares to leave for an appointment with his doctor already dressed as if in his own funeral suit. In a nice touch, the advancing fog penetrates the back dining room of the house as Edmund recounts the joy he found amid the solace of the sea, during a stint as a sailor. The fog puts us right there on the ship with him. Mary physically realizes her relapse sliding onto the floor after a drug-hazed evening chatting with the only person she can pass off as a friend, the family maid Cathleen (Colby Minifie). James and Jamie end up collapsed or kneeling, drunk. Edmund gets worked up in an argument, and finally falls, all the while hacking into a handkerchief. For these Tyrones, there’s nowhere to go but up. “Long Day’s Journey Into Night,” through June 26 at the American Airlines Theatre, 227 W. 42nd St. Tickets: $67-$147. Call 212-719-1300.